Bolt-on an Industry-Leading 200 Horsepower to your 6.4L HEMI Jeep! ProCharger was the first OEM supercharger manufacturer to offer 100 percent complete supercharger systems for the HEMI-equipped SRT-8's. ProCharger continues to lead the way with this HO Intercooled System for your SRT-8 with 7 psi of intercooled boost. The HO Intercooled System reliably and safely produces 200+ HP gains on stock engines running pump gas. Featuring the coolest charge air temperatures available, the ProCharger system delivers industry-leading power gains and superior engine longevity. Higher boost and power levels are available for modified engines. Features of the HO Intercooled System include a 3-core, air-to-air intercooler system, and the patented and proven P-1SC-1 self-contained supercharger with available 3-year warranty. Contact HHP to complete your supercharger parts list. 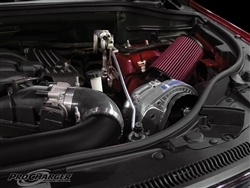 ProCharger also offers Intercooled Tuner Kits for the SRT-8 cars – i.e. this HO Intercooled Tuner Kit. With reliability, quality and power far superior to other forced-air induction systems, a ProCharger Tuner Kit is an excellent way to add even more power to modified and custom applications of the legendary 6.4L HEMI SRT-8. Tuner Kits require the purchase of a fuel system upgrade (injectors), map sensor and custom tuning. If you are running a modified engine, let HHP put together the best kit for your application. Highly Effective 3-core air-to-air intercooler - 1000 hp capacity. OUR #1 SELLER AT HHP!! !